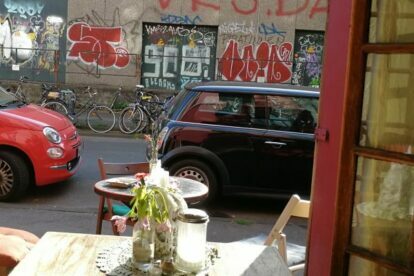 There are a lot of co-working spaces and freelance-friendly cafes popping up in Cologne. But I would prefer Cafe Duddel over any of them. You can find it right behind the student cafeteria. I come here to work and also to calm down. Even though a lot of people are usually busy working here (on their own or in groups), the atmosphere is still hectic-free. That is partly caused by the interior: no chair matches the other and it absolutely doesn’t matter. It gives the impressions that this is the one and only way to decorate the place. It looks like it was selfmade and inspires you to also build something on your own – a text, a project, or maybe even a chair. The cafe offers a large variety of (often homemade) drinks and some fresh food and cake — try the exceptional banana bread! You can find students from all over the world in this cafe so full of nooks and crannies. Inspiration awaits you behind every corner.